Foxes, traditionally, get a rough deal. They’re crafty, resourceful, clever and ambitious – which yields resentment in most quarters, but admiration in mine. 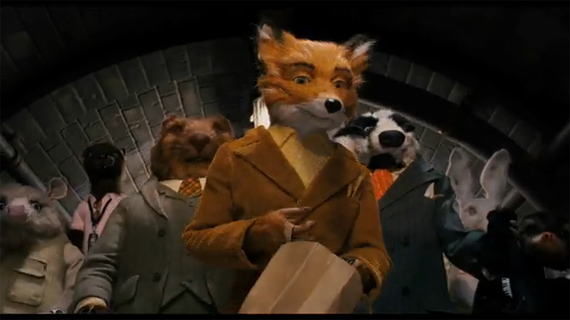 There is something very attractive about Mr Fox. He’s charming and capable, generous and daring. He’s loyal to his competitive instincts, but he also understands that his nature is his weakness. The very things that make him remarkable also cause him the greatest peril. Still, the thrill of the squab heist almost always outweighs the pressure of being caught. He can’t help himself. And so, in that sense, he is burdened by his own truth and he battles with the compromise. And what could be more human than the struggle to straddle the line between right and wrong, between the things you want and the things you should have? And it’s tough. Mr Fox can only deny his nature for so long before it gets the best of him. He falls prey to his discontent and his lust for adventure, inspiring him to stage the mother of all coups, which, despite its success, has considerably dire consequences. But, just like his nature imperils his community, it’s those same impulses that ensure their safety. And it is here, I must confess, that I feel some kinship with Mr Fox. Not that I share these traits, but I would like to. Like Randal P McMurphy, Cool Hand Luke and Atticus Finch before him, Mr Fox has the comforting ability to draw people in and settle their nerves, despite his own racing pulse. I’m attracted by that valorous sureness and strength of presence, and my heart goes out to his vanity and folly and insecurity. Under Mr Fox’s flawed leadership, even though he caused the clustercuss in the first place, we know that we’re going to be OK.
Jasper Jones by Craig Silvey is published by Windmill Books.